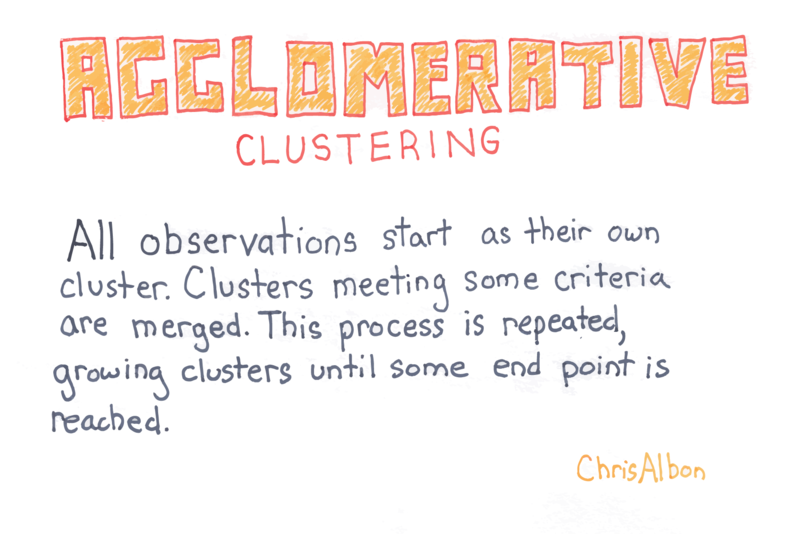 In scikit-learn, AgglomerativeClustering uses the linkage parameter to determine the merging strategy to minimize the 1) variance of merged clusters (ward), 2) average of distance between observations from pairs of clusters (average), or 3) maximum distance between observations from pairs of clusters (complete). Two other parameters are useful to know. First, the affinity parameter determines the distance metric used for linkage (minkowski, euclidean, etc.). Second, n_clusters sets the number of clusters the clustering algorithm will attempt to find. That is, clusters are successively merged until there are only n_clusters remaining.